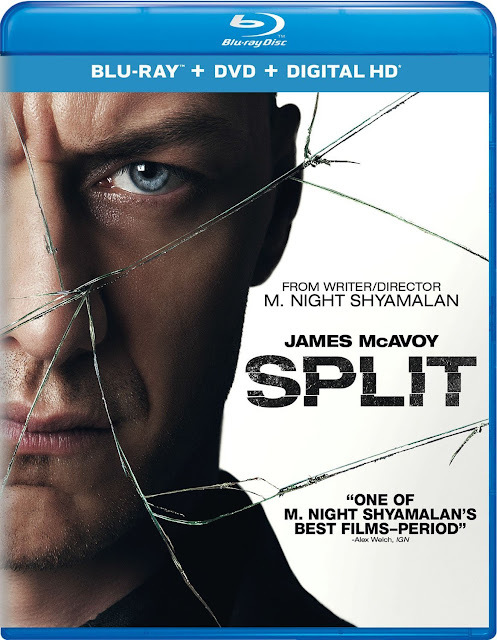 Writer and Director M. Night Shyamalan (The Sixth Sense, Unbreakable, The Visit) delivers his most gripping film yet with Split from Universal Pictures Home Entertainment. Jason Blum (Insidious, Ouija, The Visit, The Purge series) returns to collaborate with Shyamalan in the box-office hit, starring James McAvoy (X-Men: Apocalypse, Victor Frankenstein). The frightening thriller Split delves into the mysterious depths of one man’s fractured mind as a terror unlike the world has seen prepares to be unleashed. 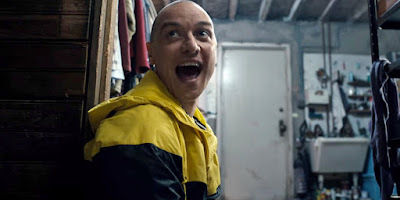 Split offers viewers a closer look at the movie fans are raving about with a never-before-seen alternate ending, deleted scenes, character spotlight, and a behind-the-scenes look at the making of the film. Teenager Claire (Haley Lu Richardson) is having a birthday party. She has invited her entire class which includes her close friend Marcia (Jessica Sula) and outcast Casey (Anya Taylor-Joy). Casey appears to be having a terrible time at the party, as expected. Claire was nice enough to include Casey, so that she wasn’t singled out as the only person from art class not invited. When Casey’s ride home is a no show, she ends up getting a ride from Claire’s dad. Although her dad walks them to the car, he isn’t the man who gets in the driver’s seat. Before they can do anything about it, the three girls have been drugged and kidnapped. They wake in a strange room that offers no information about where they are or why they have been taken. At first the girls think there are people outside their door that might help them. They soon realize that their kidnapper (James McAvoy) has multiple personalities. The man transforms his clothes, temperament and mannerisms with each personality change. The young women start to learn who their kidnappers are. “Dennis” is one of the personalities that interact with the teenagers often. The girls will also meet a young boy, a British woman and many others. Not all of the alternate personalities are bad, but it seems as those the ones running the show aren’t going to be sympathetic to the kidnap victims. Many of the personalities warn that another, known only as the beast, is coming and that the girls won’t like what they see. The cast is extremely small and James McAvoy plays most of the roles. McAvoy is amazing as he inhabits the physicality and personality of each alternate personality. He is completely believable in every role, of any age and gender. What is more impressive is that you’ll see McAvoy transform in the same scene without the help of editing. I’m not a huge fan of Writer/Director M. Night Shyamalan, particularly because he tends to have a twist that doesn’t allow me to enjoy multiple viewings. Although there are surprises, Split was just as enjoyable the second time around. Knowing whether or not the girls will survive the experience does not lessen the tension. The more, I watch it the more impressed I am with the range of characters McAvoy was able to play. Split takes place primarily underground in a dark gritty location. The excellent clarity allows the viewer to pick out multiple textures and layers to the environment. Skin tones and fine detail become extremely important when watching close ups of McAvoy during his transformations. The few pieces of bright colors, like Hedwig’s jacket, are bold with appropriate contrast. The visual quality adds to the overall mood of the film. This is a nice presentation from Universal. Split’s DTS-HD Master Audio 5.1 soundtrack offers a broad range. The low end truly shines when the action is at its peak. The audience can hear the hollowness of the claustrophobic conditions. Shot guns blasts are realistic and dialogue is intelligible when whispered or yelled. I had no major complaints from the Blu-ray’s audio presentation. Alternate Ending – M. Knight Shyamalan offers optional introduction to an alternate ending with a different feel than what you saw in the film. Deleted Scenes – Available with optional M. Knight Shyamalan introductions are: Casey at Party, Meeting Shaw, Shaw Has a Party, Shaw’s Date, Girls Talk, Patricia Talks Meat, Casey Tells Her Dad, Hide and Seek with Hedwig and Maybe We Are Crazy. The Making of Split – Your basic making of featurette where cast and crew discuss casting, writing, directing, characters, set design and more. The Many Faces of James McAvoy – A look at the many characters portrayed by McAvoy and the challenges of the task. The crew expresses their admiration for the work he has done in this film, and the kind of actor he is to work with. The Filmmaker’s Eye: M. Night Shyamalan – A brief discussion of Shyamalan’s process. Split is part thriller, part horror movie, part crime drama. James McAvoy plays a majority of the roles, and handles them brilliantly. His small supporting cast has risen to the occasion delivering genuine tension and fear. If you haven’t seen Shyamalan’s other films, you’ll probably be looking for at least one of them after you’ve watched Split. You might get more out of the film after repeated viewings, which is unusual for a thriller. The Blu-ray’s audio and video quality are above average and I recommend the purchase.